Shopping for other people is hard, but, with the help of artificial intelligence (AI), it doesn’t have to be. 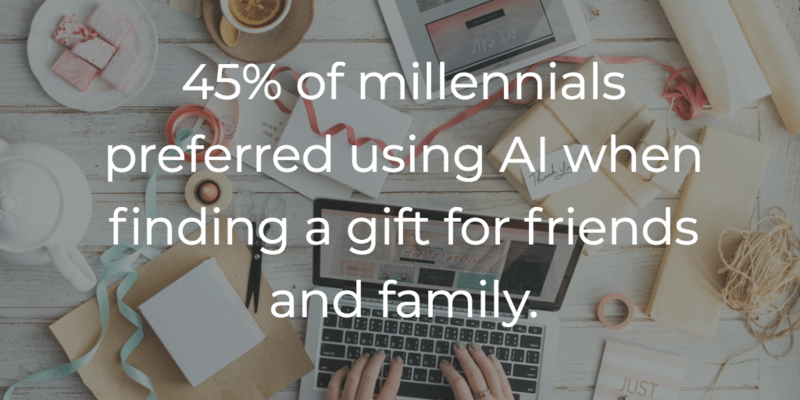 In research gathered by Photobox Group, a digital consumer service, 45% of millennials preferred using AI when finding a gift for friends and family. And no wonder, as the pressure to find the perfect gift could give even the savviest shopper anxiety. The report found that 31% of respondents said they experience anxiety when it comes to finding the right gift for loved ones and 44% worried about the gift recipient’s gift preferences. Another 10% of respondents said they rely on automatic reminders to send gifts. Companies like Token, Alyce, and online retailer Uncommon Goods are using AI to solve this challenge. An app, Token asks users to enter information about the gift recipient, including their relationship to the gift-giver, style preferences, the occasion, and the shopper’s budget. The app then uses a machine learning algorithm to sort through and narrow down products from across its database of more than 1,000 brand and retail partners into just a few the shopper can choose from. Likewise, Alyce, a corporate gift-giving platform, uses AI to help companies large and small find the perfect gifts for clients. With 30,000 potential gifts to choose from, Alyce reviews relevant social data and business goals to choose a gift that’s personalized to each individual. When the recipient receives the gift, they can choose to accept, select another gift, or choose to donate to a charity. Online-only home décor and jewelry retailer UncommonGoods uses artificial intelligence in the form of Sunny, a bot that helps shoppers find gifts for loved ones. Shoppers can enlist Sunny’s help to “find a gift they’ll love” by letting Sunny know who they’re shopping for and select age group, interests, and add suggestions of their own. Sunny then presents the shopper with suggested products that might be of interest and the more products a shopper “likes”, the better Sunny can help shoppers find more products their loved one might appreciate. The team at UncommonGoods found that shoppers who enlist Sunny’s help and then buy something eventually have a 45% higher average order value than shoppers who don’t. Photobox Group research found that 48% of respondents would trust technology to help make personalized gifts, 36% said they feel uncertain about AI when it comes to gift giving, and 13% of respondents over 55 years old said they would not trust AI to pick their gifts. But as companies and shoppers alike adopt AI-powered shopping more and more, this could very well change in the years to come. AI is transforming advertising as well. Criteo has launched Criteo AI Lab by bringing together two main arms of R&D at Criteo: Criteo Research and the Machine Learning Platform Engineering team. With an investment of $23 million (€20 million) over three years, the Criteo AI Lab will develop and integrate new, state-of-the-art AI research into our production systems, as well as to push forward our common understanding of AI techniques. The Criteo Shopper Graph works with unparalleled data collectives that see 1.4B monthly shoppers interacting with a few billion products across 18,000 partners around the world. With recent advancement in machine learning such as deep learning architectures from other domains, we’re taking our predictive performance to the next level, deepening our understanding of users and the products and brands they interact with. To learn more about how Machine Learning and AI can help marketers, download our Machine Learning below!